Eclecticism is such a wide word as applied to music that in the end it covers anything that comes out of other things. It can still be original, even iconoclastic. 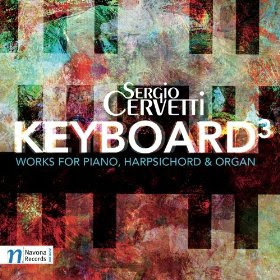 If I call the music of Sergio Cervetti on Keyboard 3 (Navona 5900) "eclectic" it is in that forward-moving, all-encompassing sense. The six works/suites included on the album, for solo piano, harpsichord and organ, respectively, have originality, a refusal to be typified formulaically or stereotypically, in the modern or post-you-name-it camp. They are not fully formed from the head of Minerva, either. They show growth and movement. The "Tres Estudios Australes" for piano, which begin the program, have at times the panache and daring of later Scriabin and classic modernist Ives, but in no easily predictable way. They are, most importantly, imbued with the strong spirit and sensibility of Cervetti himself. The harpsichord has such a historical association to its sound that it is not surprising that there are aura-matic wisps of a baroque prelude to be encountered in "Alberata." "Hard Rock" and "Candombe," on the other hand, have a motility and insistence that resonate much more with today than yesterday. Both suggest music for the dance, but not any typical dance--something singularly contemporary, angular and abstract. The very pianistic "Seven Farewells to Paradise" gives our ears a modern-day transformation of the romantic tone-poem. There is the piano-as-orchestra quasi-Lisztian tonality and chorale-like phrasings (especially the latter in the first movement), but brought to the present with expanded harmonic sensibilities. Movement two has an interesting recurring arpeggiated figure in the left hand that sets up moodily effective melodic spins in the right, both of which in turn lead dialogically to new thematic development. The third movement has repetitive chordal figures in left hand and dramatic melody in the right, which then all segue to a second complementingly expressive section. The cosmically potent-portent fourth movement begins with cascades and transforms into dissonant post-romantic heft. The fifth movement has modulating motility. The sixth reflects back with regret and the finale has a contrapuntal weightiness that marks the somber casting out from paradise. This is a suite that moves and evokes, but it doesn't lend itself easily to verbal description. The lesson is in the listening. "In Principio Erat Verbum" evokes a timeless, poetic organ mood both ancient and modern. It has strong depth and fittingly concludes the recital. In the end we hear a diverse musical personality in a variety of moods and projections. The performances are sometimes perhaps not definitive; other times may well be so. In every case we get a very good hearing of the piece at hand. Cervetti gives us a self-portrait that can be startling and yet evinces a spanning of vast musical spaces. This is nothing lightweight; it is quite substantial in its brilliance and craft. A good one!